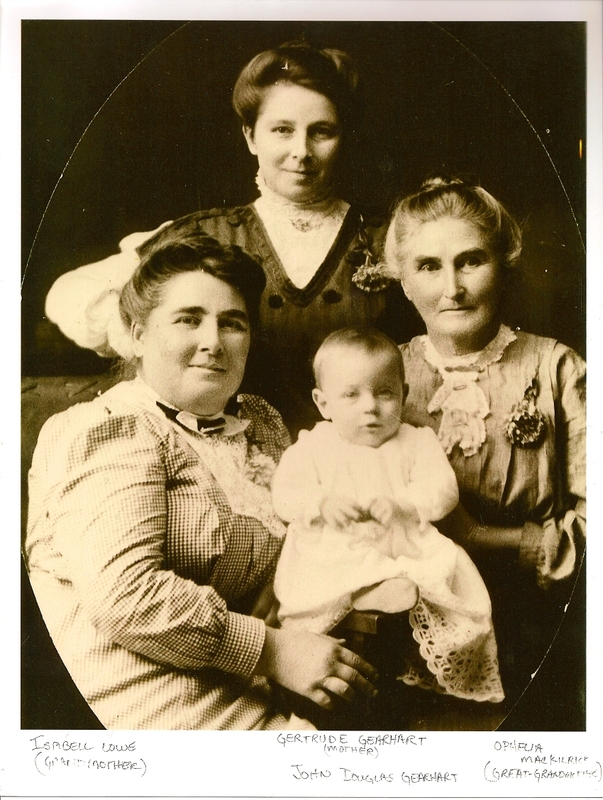 Some time ago, I began a series of posts on relatives I remembered from my lifetime, writing about the four great-grandparents I knew on my mother’s side of the family. I did not personally know any of my great-grandparents on my father’s side. All of them probably* died before I was born, and things are complicated by the fact that my grandfather David Swier was adopted, so he has two sets of parents: his adoptive parents and his natural parents. I have been able to learn a great deal about them both through research and through connecting with cousins who descend from the same family. 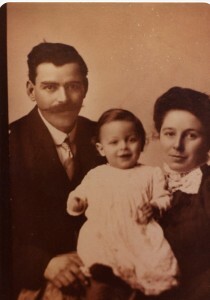 In this series, I plan to share what I know of my great-grandparents on my father’s side, beginning with my natural great-grandfather, Omar Alfred Gearhart. Omar Alfred Gearhart had the unusual birthday of February 29, 1884. He was born in Colo, Story County, Iowa to George Douglas Gearhart and Ruth Ella Willhide. I learned a lot about Omar Alfred Gearhart from his World War I draft registration card. He was living in Spokane, Washington on September 12, 1918 when he registered. My grandfather David would be born in that same city in 1921; however, the 1920 census lists Omar’s residence as Wallula, Walla Walla County, Washington. He is described as having a medium height and build, gray eyes, and black hair. His wife’s name is given as Gertrude Gearhart. 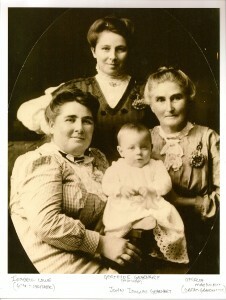 Gertrude was born Gertrude Nettie Perkins. They married on Christmas Day in 1910. His occupation is listed as “Laborer, Mechanical” on his draft card, and indeed he owned a garage later on. I wish he had passed his aptitude for car mechanics on to me, but he did pass it to his son and grandson (my father). At the time of his draft registration, however, he was working for the city of Spokane. I wonder if he might have been responsible for keeping city vehicles in working order. Omar Alfred Gearhart would have been a young man when the earliest cars were manufactured, and I find it interesting that he was on the ground floor of this new industry. Family lore holds that he survived gunshot wound to the head, but that the head injury altered his personality. I don’t know the circumstances, but he would later be murdered in his garage by his business partner, leaving behind Gertrude, who was pregnant, and their eleven children. Gertrude was unable to work, and though the eldest children picked up work here and there, ultimately the family was torn apart when Gertrude gave her children up for adoption. In a letter to her daughter Bessie, Gertrude shares some family information, including that she believed her husband’s origins were Dutch. They were not. The family who adopted my grandfather was Dutch, but his natural ancestors on his father’s side were German—Pennsylvania Dutch, corruption of the German Deutsch, which may be the source of Gertrude’s confusion. While Omar Alfred Gearhart’s parents would remain in Story County, Iowa for the rest of their lives, Omar moved to Washington State. I’m not sure what brought him there. He was certainly living there before 1910 when he appears on the census in Moran, Spokane County, Washington. In the 1900 census, he is still living in Iowa with his parents, which makes sense, as he was 16 years old. At one time, his brother John was living with him (1920 census), and it appears as though they were in business together. Interestingly, family researchers seem to have some confusion about his location. Another John Gearhart living in Missoula, Montana and married to a woman named Margaret appears to have been grafted onto this tree. He can’t have been in both Missoula and Wallula, Washington in 1920, and the census clearly lists John Edward Gearhart as Omar’s brother, so there can be no confusion about whether he’s the correct person. I have no reason to believe John Gearhart was involved in Omar’s death, but I also cannot find him or his wife in the 1930 census, which would have been taken in either the year before or the year that the murder took place. I should note the Missoula, Montana John Gearhart was also born in Iowa, although in 1884 rather than 1880. Perhaps he was a cousin or other relative of John Edward and Omar Alfred Gearhart’s. It’s confusing, though, because he was in Montana when he registered for the draft during World War I.
I should note, however, that I also can’t find Omar Alfred Gearhart on the 1930 census; though his death date was given by Gertrude in a letter to her daughter Bessie as December 29, 1930, this date doesn’t make sense with other information because my grandfather had already been adopted by the Swiers by the time the 1930 census was taken, and his sister Jessie and brothers John and Donald were living in different homes, all listed as boarders. However, it could be that the details of the story are confused and that the children were taken away before their father died. On the other hand, in that same letter, Gertrude couldn’t remember the date Bessie was born, and she also said her husband was Dutch. I couldn’t find the other children or Gertrude on the 1930 census, either. I hope that the 1940 census may shed some light on what happened, but until I can do some serious searching in newspaper archives, I don’t think I’ll learn much more about Omar’s death. I do have one living great-aunt, but she did not remember the details of the event and indeed didn’t realize she’d been adopted until my grandfather told her about it at school. She would have been around two years old or so when it happened. *I don’t know when my great-grandfather Frank Chatman died. My cousin Dara sent scans of the following letter from my great-grandmother, Gertrude Nettie Perkins Gearhart Lightle. I have discussed her story previously on this blog. I was sure glad to hear from you again. I looked in vain for a letter all winter. I have been sick so much but did not go to bed as I had too much to do. Alice and her baby were here after she left the hospital [Gertrude’s daughter Alice]. She was too weak to do anything for quite a while, then the baby got sick, too. He just began to get better when Tom came home from PWA camp sick with the “flu.” He took that & was a very sick baby. They went home with him so they took care of him, but I took it too. I was in bed off and on for a month, then I began to be bothered with my eyes & they are bad yet. I wear glasses to read or sew, but I couldn’t do either one for several weeks. Now I can only read a few minutes at a time. I am glad you [sic] Mother Zeiglar is better. I think of her so often. You were born in Metaline, Pend O’Reile Co. Washington [Pend Oreille County] March the 26-27 or maybe 28th 1924. I have forgotten the exact day, but you have that already. My maiden name was Gertrude Nettie Perkins. I was born at Hector, Minnesota September 13, 1887. Your fathers [sic] name was Omar Alfred Gearhart born in Iowa (I don’t know what town) February 29, 1884. [Omar Alfred Gearhart] Died in Spokane, Washington December 29, 1930 age 46. I never had a birth certificate for you. Your father was Holland Dutch decent [sic] [actually Pennsylvania Dutch, or German] and his ancestors settled in the Ohio Valley. If you will write to Grandma Gearhart she can tell you more than I can. Mrs G.D. Gearhart Box 196- Maxwell, Iowa. I am English on my fathers [sic] side. His folks settled in Virginia shortly after the Revolutionary War and were English Quakers. 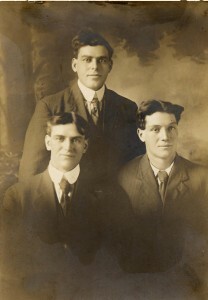 My mother’s folks were Scotch & Irish & one Great-great-grandmother on her fathers [sic] side was English, named Smith. Granny’s father came to this country before the Civil War & settled in Wisconsin. His name was Montgomery & his wife’s name was MacGregor, both scotch [sic]. My uncle Sherm Young at 1320 So. 7th Street in Yakima can tell you about them. You had mumps and chicken-pox and no real accidents & was never inside of a hospital while I had you. I had 13 children, one was still-born (dead) and one premature as far as I know [word missing] are 11 living. Do you know whether Margery is adopted or not? I forgot to ask them when I was up there. It’s important to know the family background in order to put this letter in context, and the story I linked at the beginning of this post is the best place to start. Until this week, I had never seen a photo of my great-grandmother. Within the space of two days, I have received two different photos from two cousins and an additional photo of Omar Alfred Gearhart, my great-grandfather.